The assembly lines in Trollhättan are still down and will be down for a while. With Spyker & Saab gasping for money, another Chinese party threw them a life line today. The price: Saab will be in Chinese control if and when all is approved. “The equity stake of Pang Da in Spyker will remain at 24 % raising its investment to EUR 109 million. The share price remains at EUR 4.19 per share and Pang Da will have the right to nominate up to two members of the Supervisory Board of Spyker. 29.9 plus 24 percent equals 53.9 percent, says my calculator. Bingo. Saab is Chinese. Then, there will be several Chinese joint ventures. There will be a manufacturing JV that makes “Saab branded and child branded vehicles for the China market.” Saab Automobile and Youngman will each have a 45 percent interest in the manufacturing JV and Pang Da will hold the remaining 10 percent. Then, there will be a distribution JV. Saab Automobile and Youngman will each have a 33 percent interest, Pangda will hold 34 percent. Now keep in mind that Saab is owned by Spyker. If the deal goes through, Youngman and Pangda will own the joint ventures via their ownership of Spyker and hence Saab, and then again directly. Victor Muller better polish his resume. Production will stay shut down at least until the end of this week, company spokeswoman Gunilla Gustavs told AFP, adding it was too soon to say when the assembly line would begin moving again. Youngman is a relative nobody in the highly fractionalized Chinese auto market. They are more known for their buses. Youngman Lotus makes uninspired cars with the Lotus badge for added cognitive dissonance. The Financial Times called around and received nothing but unenthused comments. Bill Russo, head of Synergistics, a Beijing auto consultancy, and former head of Chrysler in China, said: “Going public before doing the political engineering is generally not a pathway to success in China”. “I don’t think Youngman has enough credibility to be the third partner in the Pang Da-Saab deal”, Namrita Chow, analyst with IHS Automotive, told the FT. “Beijing is unlikely to give approval for a venture that will bring direct competition to BAIC”. Maybe, maybe not. There are rumors in Beijing that the smaller companies could be stalking horses for a bigger Chinese company. Saving Saab in Europe and setting up a new factory in China needs someone with bigger pockets. What are the insiders in Sweden saying? Not much. The Saabsunited fanzine runs the press release uncommented between the story of a Saab with three big dogs, and an update about the still unsolved leaseback. And what does inside-saab.com have? A story about a drive through the Swedish midsummer night. Prior dealings received much more fanfare. Victor Muller of Saab seems to have been saved by winning over Chinese Youngman as a production partner for Saab. But it is very unlikely that the Chinese government will approve the deal. And certainly not in the short term. Victor Muller has done more for the promotion of the Chinese auto industry than hundreds of expensive campaigns. Until recently Hawtai, Pangda and Youngman were unknown Chinese car companies, but are now, thanks to Muller, suddenly on the map in the West. Four days later after a collaboration with Hawtai bounced half of May, he was able to trick China's largest car distributor Pangda for a substantial investment in the ailing Spyker. Because Pangda has no production license, a third party was necessary. Therefore Youngman was found, which will take a share of 29.9% in Spyker for €136 million. Pangda will increase its investment up to €109 million. According to Spyker CEO Victor Muller this funding will secure his company in the medium and long term. That is, however, doubtful. The probability that the National Development and Reform Commission (NDRC), the mighty Economic Planning Agency China, will approve the deal, is small. "I do not expect China to approve this deal, especially not in the short term”, says Namrita Chow, analyst IHS Automotive in Shanghai. Spyker is in a great hurry to find a wealthy partner for Saab. Therefore Chow is surprised that the company thinks this construction will soon get approval. "Spyker, has entirely misjudged the Chinese market. The NDRC will not allow Spyker to impose a time table. I don’t expect that there will be a decision within ten days. The approval of the cooperation between PSA Peugeot and Changan Automobile also took over one year. " To survive Saab cannot do without an injection for such a long time. Bill Russo, senior automotive consultant with Booz & Company in Beijing also warns against too much optimism. "Deals in China are often more complicated than they seem at first. Much effort remains to be put into negotiating contracts and acquiring approval of the government. That takes time and Saab does not have that luxury." According to Russo, a detailed joint venture agreementand a feasibility study are required as proof of the financial need for the deal. "All expenditure on R&D and manufacturing and locations must be included. This will cost 18 to 24 months." Apart from the time pressure, analysts see no reason why China would approve the deal content wise or financially. "I just do not see it happen," Chow says. "Saab is an onerous and highly distressed brand, while Youngman is not among the top fifteen the Chinese car manufacturers. " "Adding a weak player is not consistent with government policy ", says Russo. With investments by Chinese companies the NDRC looks at the wordlwide power of a car brand and the technology. "The NDRC is also trying to consolidate more than one hundred dealers, including many weak players, into a few strong players. Adding a weak global brand does not fit into that policy. " Holding Company (BAIC) wants to bring old Saab Models on the Chinese market with General Motors licenses, the former owner of Saab. They are not allowed to be called Saab, but they will intensify competition with Pangda-Youngman. "BAIC will be very unhappy about the deal between Saab and Youngman and lobby firmly against it in Beijing" Chow expects. "The big players in China will not buy the Saab brand," Chow thinks. "It has no positioning in China and will lose a lot of money. There is no interest for that. " Domestic auto markets in China and India may no longer be able to repeat last year’s impressive sales records, as auto sales growth in both countries’ continued sliding in May. Experts say the market downturn is caused by a combination of long-term and short-term issues, including the impact of Japan’s earthquake and tsunami, soaring fuel prices, and inflationary pressure. Statistics released by the Society of Indian Automobile Manufactures (SIAM) on June 9 shows that, while April-to-May auto sales records grew by 16.34 percent from a year earlier, the year-on-year growth in May alone slowed to 13.4 percent. In China, according to statistics by the China Association of Automobile Manufacturers, the booming Chinese automobile sales market has been witnessing rare decreases since April. Both production and sales have decreased by 12.14 percent and 10.9 percent respectively from a month earlier, and 4.89 percent and 3.98 percent respectively from a year earlier. Since the two countries follow similar paths, enjoying high economic growth rates averaging 8 percent to 9 percent while simultaneously suffering high inflationary pressure, the negative factors affecting their auto markets are also similar. Both countries’ monetary tightening policies could bring down people’s passion for consumption and discourage production in enterprises. In India, the latest consumer price index (CPI) released in April increased by 9.41 percent, a four-month high from the beginning of the year. This increase is a signal that the government’s tightening measures may not end any time soon (even after nine interest rate raises since last year) and car buyers still need to pay back high interest for their car loans. China is also faced with the challenge of a CPI that still stands high and is predicted to repeat the 32-month-high rate of 5.4 percent as it did in March. In order to curb inflation, the People’s Bank of China has raised bank interest rates four times since last year, worrying a variety of manufacturers who seek fast expansion. Nowadays in China and India, the burden of affording fuel is becoming greater than the burden of affording a car. Led by global crude oil price growth, fuel prices have surged in both economies. Gasoline prices in India rose nearly 9 percent last month, and China has increased both gasoline and diesel prices twice this year. During China’s latest price hike in April, gasoline rates grew by 5.6 percent and diesel rates increased by 4.9 percent. While the consequence of high inflationary pressure had been foreseen, Japan’s earthquake and ensuing tsunami were a shock to both countries’ auto markets. Production declined because of a temporary supply shortage. In addition, buyers who looked to purchase Japanese cars may have hesitated as prices of Japanese cars stayed firm and have even increased due to reduced supply and production. According to a recent report in the Guangzhou Daily, January-May Honda sales in China dropped sharply by 8.9 percent from a year earlier, and Toyota sales also suffered a year-on-year 2.1 percent decrease over the same period. Another domestic policy may have also driven the Chinese auto market down. Since the end of last year, China has removed small-car tax incentives, which might have impacted lower-end car buyers’ purchase plans. However, some experts in business consulting companies still believe China’s consumption power will help maintain stable growth in the country’s auto sales market. Ivo Naumann, head of AlixPartners China, predicted a 10 percent to 15 percent annual growth in China’s light vehicle sales despite the current downturn, thanks to the support of the rapidly expanding wealthy consumer base. Bill Russo, head of Synergistics auto consultancy, said the current car market performance in China can still be regarded as “strong,” as it maintains relatively stable given the present headwinds. Compared to the consultants’ confidence in the Chinese market, forecasts by Indian analysts on India’s auto sale market tend to be more conservative. The SIAM worries it would be hard for India’s domestic auto sales market to hit full-year targets based on its current performance, predicting the growth rate of the year will be halved compared to last year, from 30 percent to 15 percent. 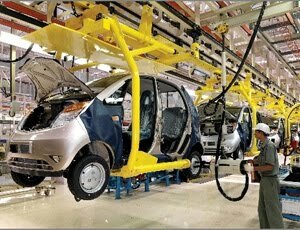 Jatlin Chawla, an automotive analyst at IIFL in Mumbai, says while he expects a slowdown in India’s car sales will continue for another three to four months, the customarily busy festive season in India – starting in September – is hoped to revive the country’s auto sales and is very critical to carmakers. The company that owns Saab, the struggling Swedish carmaker, said it had reached agreement with two Chinese companies on a €245m deal to distribute and produce cars in China. Zhejiang Youngman Lotus Automobile will take a 29.9 per cent interest in Spyker Cars, which owns Saab Automobile, for €136m, alongside dealership group Pang Da Automobile Trade Co, which signed an agreement in May to distribute and produce Saab’s cars in China, Spyker said on Monday. Amsterdam-based Spyker had previously said it planned to add a third partner to a Chinese-bankrolled plan to rescue Saab by selling and producing its cars in the world’s largest car market. Spyker said on Monday that it had signed a memorandum of understanding on the tripartite deal, and that it was subject to regulatory approval. Automotive analysts in China were sceptical that authorities there would allow the deal to go ahead. Pang Da entered the frame after a proposed earlier deal with Hawtai, another Chinese carmaker, collapsed. Foreign investments by Chinese companies are subject to approval by at least three government agencies, including the country’s National Development and Reform Commission, which recently has become stricter about the companies which it allows to set up joint ventures or plants. Bill Russo, head of Synergistics, a Beijing auto consultancy, said: “Going public before doing the political engineering is generally not a pathway to success in China”. Pang Da signed an MOU in May that would have seen the Chinese company pay €65m to take 24 per cent of Spyker on a fully diluted basis. With Youngman entering as a new shareholder in Saab’s owner, Pang Da will still take a 24 per cent stake, but raise its investment to €109m. The three companies will set up joint ventures to distribute and produce vehicles under Saab’s brand and a new marque to be owned by the venture. The partners will take stakes of about a third each in the distribution joint venture. Saab and Youngman would each take 45 per cent of the manufacturing tie-up, with Pang Da holding the remaining 10 per cent. Separately, Saab said on Monday it was in talks to raise more cash by selling and leasing back its property, and would announce a deal shortly. Saab, which employs about 3,700 people, has halted the line at its plant in Trollhättan, north of Gothenburg, several times since March because of problems paying its suppliers. Last week it stopped production again as it sought to shore up a consistent flow of parts. The brand sold fewer than 32,000 cars last year. Youngman produces buses and some cars for Lotus, the British niche sports car maker. Yale Zhang, managing director of Automotive Foresight, an industry consultancy in Shanghai, said the deal had little chance of government approval because its small size contradicted the government’s oft-stated goal of forcing consolidation in the highly fragmented Chinese car industry. Another analyst said that the proposed venture could face opposition because of a pre-existing deal under which Beijing Automotive Industry Corporation (BAIC) bought production equipment for two outgoing Saab models. “Beijing is unlikely to give approval for a venture that will bring direct competition to BAIC”, said Namrita Chow, analyst with IHS Automotive.